Though Black Spring centered on Lina's life, Anna was the only character worth a damn in the novel. Lina was a tantrum-happy, spoiled brat who treated everyone around her poorly, and never once did she draw the slightest bit of sympathy from me. Her foster brother and soulmate, Damek, was uninteresting in the beginning and progressed into something much worse. I have never in my life been so torn between indifference and hatred for characters. They were awful to the extreme and deserved the misery in life that came to them. Seriously, it was all of their own construction. Anna was kind and good enough to put up with her beastly friends, and I hope there is a special place for her in literary Heaven since she abstained from drowning Lina and/or Damek. The world-building was an even bigger disappointment. Yes, it was partially from my own expectations, but I felt very misled by the synopsis. The wizardry in the novel was minimal - it was just some cranky, evil geezer named Ezra wandering around the story, asserting his will and enforcing The Lore. The threat of his wrath loomed over Lina and her family, but that's about it. When he did act, it was underwhelming. 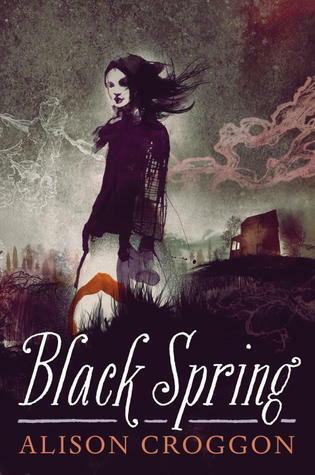 As for the vendetta, I began thinking it was some dark and mysterious curse that was plaguing the Northern villages as I read Black Spring. Nope, it was just a blood feud where opposing families take turns killing each others' men until they're all dead or the king and wizards say they can stop. Even that managed to be dull. There was an ominous feeling about looming events in the book that kept me reading, but it sputtered out. I just couldn't care enough about Lina. I know I've been ranty about Black Spring, but the novel is not completely without merit. I am sure that fans of gothic or Victorian literature will eat up the story that read true to the time period it's paying homage to, but it definitely was not for me. To be fair, I hated Jane Eyre the first time that I read it, and it later became a favorite. Maybe Black Spring is something I would have to acquire a taste for as well.